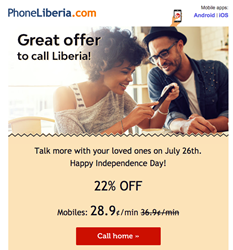 Liberians abroad have 22% discount on their calls to Liberia on July 26, 2016, with PhoneLiberia.com. On July 26, the rate to call mobiles in Liberia is the lowest. Although the regular rate to call Liberia with PhoneLiberia.com is generally very low on the global market, the current offer on July 26th helps one save even more. On July 26, 2016, anyone can call Liberia mobiles at 28.9 cents/minute. Outside the promotion the calling rate on PhoneLiberia.com is 36.9 USD cents/minute. The 22% discounted rate is only available on July 26, 2016, until 23:59 EST. One cannot call at this rate, if one does not have a PIN yet with PhoneLiberia.com. But this is easy to acquire, by making a purchase of minimum $2 Voice Credit, credit that never expires and is available for life. KeepCalling app by PhoneLiberia.com helps one make calls on the go. It is available in Spanish and English on App Store and Play Store and costs nothing to install. Those who don't have WiFi, or a 3G/4G connection can use access numbers. One should pick the access number in his/her area, make a call to that number and follow some easy steps as if using a calling card. But in comparison with a calling card, PhoneLiberia.com access numbers can turn an international call into a local call by activating the PINless and Speed Dial features. Those who prefer making international or long-distance calls from their PC or laptop to any kind of phone abroad, maybe while browsing, are advised to use Web Call. This is a free desktop app made by PhoneLiberia.com, available in the PhoneLiberia.com online account. No download is needed. Besides the Independence Day 22% discount on calls, another constant way to save with PhoneLiberia.com is to collect Thank You points. On each purchase one gets Thank You points that can be later turned into Voice Credit for free calls. Anyone can do that from his or her own account if he or she raised to 1000 points. On the other hand, the same amount of points can be collected by inviting two friends to try the service on PhoneLiberia.com for as little as $2. Besides the Voice Credit service for calls, PhoneLiberia.com facilitates international top ups to mobiles in Liberia using the same account. That is most helpful for relatives and friends back in Liberia who will receive mobile credit from their relatives abroad thanks to the Mobile Recharge instant service. It saves them time, hassle and even money. Only Lonestar Cell MTN and Celcom mobiles can be recharged for the moment. PhoneLiberia.com hosts several promotions during the year on both calls and mobile credit transfers. Those subscribed to "Get offers" (button down the website homepage) will be notified by email. There are 4 features that can turn an international call into a local call. Voice Credit can be used not only to call Liberia, but also landlines and mobiles in other countries, at low rates. Customers have direct access to their calling records. All transactions and invoices are available online. Payment can be made using several payment methods: all major cards and PayPal too. Payment is welcome in any currency, no matter the country of residence. The online account is mobile-friendly, just like the rest of the website, so anyone can access it on the go. Promotions, contests and other events will be announced by email, once subscribed to the Newsletter ("Get offers" button in the footer of PhoneLiberia.com). PhoneLiberia.com has been serving the Liberian diaspora since 2002, facilitating long-distance calls and long-distance mobile credit transfers. The website is a brand of KeepCalling, a global telecommunications company registered in 2002 in the USA. Presently, KeepCalling provides its services to hundreds of thousands of consumers, with a focus on customer satisfaction. KeepCalling has been listed by Inc 5000 as one of the fastest growing companies in the USA for 5 consecutive years. In 2015 the company registered a revenue increase of over 200% from 2011 to 2014.